Mackenzie Baker, Angelika Myers, Kaylee Phelan and Andrea Garrison run in the 100 meter dash during Greenville’s youth track and field camp on Friday. GREENVILLE – Among a record number of campers, Bill Plessinger saw some athletes with potential to be future state champions. More than 100 boys and girls attended Greenville’s 15th annual youth track and field camp last week, which was 20 more than attended last year and more than double the number of campers from four years ago. And among the campers were the best collection of young track and field talent Plessinger has ever seen. Along with 101 boys and girls ranging from kindergarten through junior high was the youngest camper in the event’s history, Plessinger’s 3-year-old son. They all learned about the various track and field events and concluded the camp with a meet. With having so many kids at this year’s camp, Plessinger and his staff had to add extra instruction to keep everyone busy. 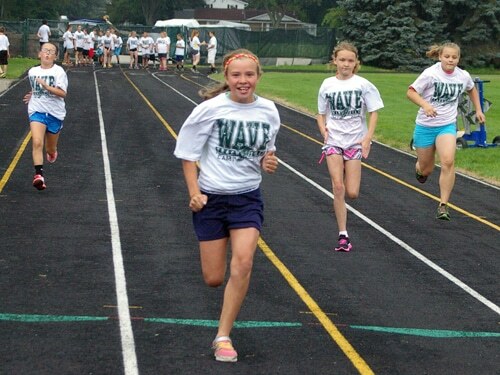 For the first time campers learned how to use starting blocks and the proper technique of passing batons in relay races. To accommodate the large number of campers, Plessinger also received help from assistant coaches Stephanie Lind and Matt Levek plus 14 current or former Green Wave track and field athletes. For many of the high school helpers, the youth camp is an annual tradition as they attended it when they were younger and now they help each year. Like with the high school athletes, Plessinger saw a lot of enthusiasm from the youth campers who came from Greenville and other communities including Arcanum and Versailles. Ten of the campers – Adam Edwards, Riley Emrick, Arianne Garrison, Charlie Jasenski, Noah King, Libby McKinney, Angelika Myers, Harrison Plessinger, McKenzie Pressnall and Clair Rammel – were recognized as the campers of the week for their efforts throughout the week with competitions and sportsmanship. With the camp growing, Plessinger had to be more organized than ever to accommodate the large group. But he’s confident that he and his helpers will be ready for more campers if the camp continues to grow. “It was the best camp we’ve had in a long time because my help was awesome,” Plessinger said. “There was a lot of kids. I was really concerned with that many kids.